The news that former Rupert Murdoch consigliere Rebekah Brooks—who is awaiting trial for six separate crimes, including, most seriously, “conspiracy to pervert the course of justice”—received an $11.2 million payoff for her actions that helped destroy News of the World, in addition to covering her legal fees and a driver, implies that perhaps the alleged crimes of which she is accused are not exactly frowned upon by her higher-ups. While Brooks, together with her fellow ex-News of the World editor and former spokesperson for Britain’s current conservative government, Andrew Colson, are looking at potential prison time, yet another member of the ex-News of the World editor’s club is doing just fine: That’s Piers Morgan, who inherited Larry King’s chair as the star of the key interview program on CNN. Speaking to his former colleagues in the world of British journalism about those “hits,” Ellison most frequently found “complete disdain” for Morgan’s journalistic methods, his extravagant self-promotion, and his apparent lack of redeeming social purpose. “Every once in a while, one of us writes a story we hope will get him fired from CNN,” one editor told Ellison. One such story, perhaps, recounts the time when, as the editor of The Daily Mirror, Morgan was accused of making stock trades based on tips from his financial reporters before they went to press. He was not charged with a crime but was severely censured in 2000 by Britain’s Press Complaints Commission for, as The Guardian noted, “serious breaches of the financial journalism provisions of the editor’s code of practice.” They brought up the phony pictures that Morgan had published of British soldiers appearing to torture Iraqi prisoners in 2004. Morgan said he “[felt] like it was a moral duty.” The incident ended up getting him fired. To be fair, Morgan not only misled his readers, he also misled himself. In his book The Insider: The Private Diaries of a Scandalous Decade, filled with allegedly contemporaneous diaries from the previous 10 years and published by Morgan in 2004, he recorded on Wednesday, March 26, 1997, that he had “Tea with Tony Blair at No. 10. He was yawning a lot and drinking endless cups of tea. I tried to wake him up a bit.’” Ellison notes how strange this is, since Blair had not yet been elected. “’Very odd that John Major allowed Blair to come in and host someone for tea,” joked one London journalist and longtime rival. 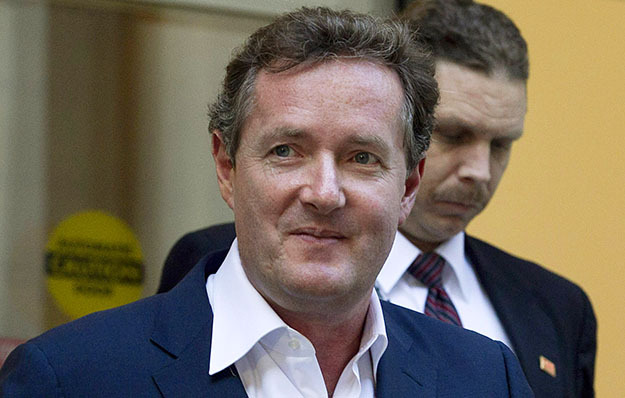 “Amazing that he made the exception for Piers!’” guffawed another. Following his generally nefarious career as a tabloid editor, CNN chose Morgan to replace King (who had held the position for 25 years) with only one season of Donald Trump’s “Celebrity Apprentice” and another as a judge on NBC’s “America’s Got Talent” in the way of experience before U.S. television audiences. He began his run with 1.3 million undoubtedly curious viewers but within a year he was getting some of the worst ratings in CNN history. Those low ratings undoubtedly made a significant contribution to the decision by CNN worldwide head Jim Walton to resign in July (though not effectively until the end of the year). One has to wonder, however, how Walton will look back on his decision to pick Morgan as CNN’s franchise player. Given Morgan’s past as a Murdoch employee and present as a Murdoch-cheerleader—he insists that the poor fellow is the victim of a “witch-hunt“—it sure wasn’t the dreaded “liberal bias” of which the station is routinely falsely accused. In the end, it’s hard to care about Morgan at all. What is one more self-promoting, morally challenged, celebrity-chasing tabloid hack—more or less—on either side of the Atlantic? The real issue here is CNN. Why in the world would a network that pretends to pride itself on down-the-middle, no-nonsense news—that seeks to distinguish itself throughout the world as the “best news team”—want this fellow as its standard-bearer? CNN’s ratings are already the lowest of any cable network. Wouldn’t it make more sense to pick journalists who can instill a sense of pride in those who work there and perhaps attract those underserved viewers looking for an intelligent, serious-minded conversation with political and cultural figures? Sure, Jim Walton deserves to resign, if only for picking Morgan to replace King. But the question today is what conclusions will be drawn by Walton’s as-yet unnamed successor? Will CNN one day become a place where viewers can once again turn for genuine news? Or should it continue down the road traveled by Morgan and change its name to the “Cable Nonsense Network” instead? Eric Alterman is a Senior Fellow at the Center for American Progress and a CUNY distinguished professor of English and journalism at Brooklyn College. He is also “The Liberal Media” columnist for The Nation. His most recent book is The Cause: The Fight for American Liberalism from Franklin Roosevelt to Barack Obama.